Sited on The Old Haig’s Distillery which operated from 1769 to 1860. The Mount Herbert Hotel was founded in 1955 and has become one of Dublin’s most famous hotels. The hotel is located in exclusive Ballsbridge where many diplomatic embassies are based. Just ten to fifteen minutes from the city centre it offers top class three star accommodation and is well known for its warm and friendly atmosphere. They also offer weekend breaks and special offers. The hotel offers 172 beautifully appointed modern En suite bedrooms each containing cable TV, direct dial telephone, internet access, trouser press, hair dryer, tea and coffee making facilities and some rooms are designed for wheelchair access. The majority of the rooms are double and twin bed rooms but a number of single bed and family rooms are also available. The rooms are designed for peace and tranquility to ensure a good nights sleep after a hard day in the city. The Tritonville Bar and Terrace provides a wide selection of reasonable priced snacks and casual dishes until 10.30pm. It also has a wide screen TV which will keep all sport lovers up to date. The Brasserie provides a lip smacking choice of dishes in a modern setting which overlooks the fabulous floodlit gardens. The European style cuisine is prepared by highly trained chefs using the finest of fresh Irish produce. There is an extensive wine list to compliment the meals and really tickle the taste buds. Ideally located in the up market, Ballsbridge home to the rich and famous in the heart of Dublin 4. The hotel is just a 15 minutes walk from Grafton Street, Dublin’s premium shopping area, St Stephens Green with its beautiful park and Trinity College. Also check out The National Gallery and The Natural History Museum. 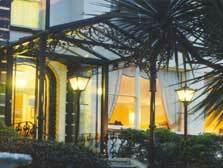 The hotel is close to the RDS and Lansdowne Road, where you will find many musical and sporting events.